These no-bake Healthy Homemade Peppermint Patties are secretly sugar free, low carb, gluten free, dairy free, and vegan, but you’d NEVER know it… they taste just like store-bought! As a kid, I was always a fan of milk chocolate. When I went trick-or-treating on Halloween, candies containing dark chocolate were the first things I’d give away to the other kids, especially the York Peppermint Patties! I traded them for my preferred sweets, like Hershey’s bars, Snickers, M&Ms and Twix. Milk chocolate is softer, sweeter, and always made me want more! The perfect cluster of sensations to a sugar-obsessed kid. But something changed in me as I grew older. I started appreciating the flavor of dark chocolate. Although it still wasn’t my first choice when it came to chocolate, well, you know, I appreciated it a little more. I found that when dark chocolate is paired with another flavor, like orange or mint, it becomes so much more appealing. After I ate about three one of these Peppermint Patties, I became a reformed chocolate addict. I love dark chocolate! So cool, so refreshing. Feelings milk chocolate never provided. So soft, so delicate. Textures I love when it comes to sweet snacks. This DIY recipe for no-bake Healthy Homemade Peppermint Patties are secretly sugar free, gluten free, dairy free, and vegan, but you'd NEVER know it -- they taste just like store-bought! 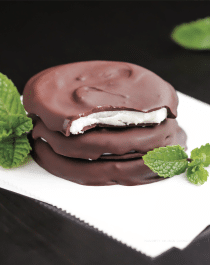 Good lord, a high protein peppermint patty? You are a genius! you are great. End of story :)! p.s. I was just browsing through your FAQ page and I notice that you said you eat around ~3000 calories per day. That’s wonderful and so refreshing to see (especially around blogworld where must people eat downwards of 1200 calories). I’m actually trying to gain weight and pushing myself to eat 3000-3500 calories. I’d love to see what I typical “day in the life” of eats looks like for you. That is, if you’re willing to share. These are incredible! And high protein? Maybe coming home to these every morning will get me through my CrossFit workout. Yum! High protein peppermint patties that has no questionable ingredients? I’m sold! These were amazing! So Yummy! I just can’t get enough. Thank you for the recipe. I’ll definitely be using this one. Ever since finding your site, I have been coming back here everyday! I am in a very similar situation as you, only I wish I could be majoring in nutrition but alas, I’m stuck in computer science. Anyway, on to my question. I just found out that I am allergic to Stevia, but I really want to make this recipe! 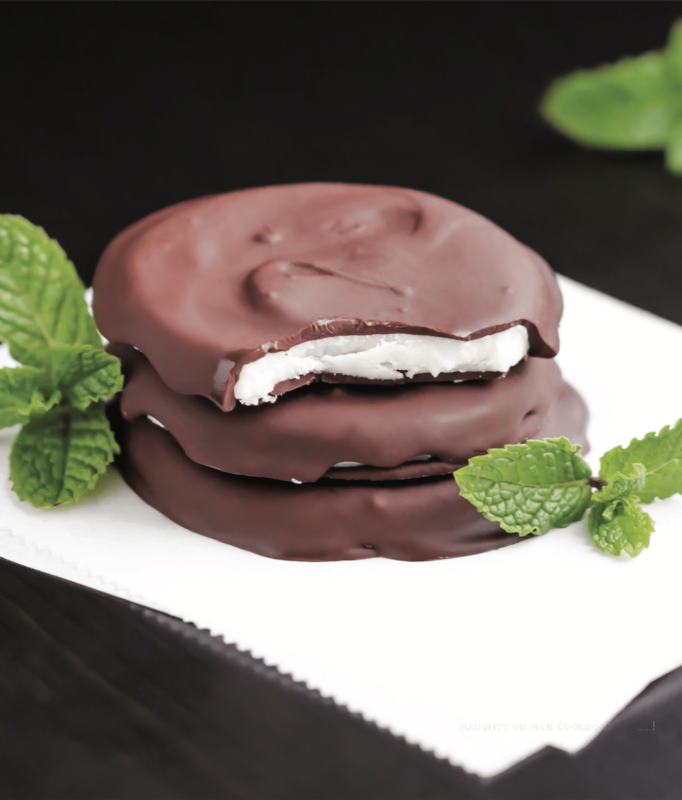 York peppermint patties are my favorite! Are there any substitutes I could use? Thanks for the suggestion and I’ll be sure to try this recipe while I’m home on break next week. I’ll let you know how it goes! If you can’t have the stevia then I would say increase the erythritol to 120g (10 tbs) and maybe add 14g (1 tbs) more of the coconut oil and 1 tbs more of the water. These are just guestimations, but when you are mixing the “dough” just make sure it isn’t too dry or too moist… it should be like a pie crust when you roll it out. Good luck! Anyways, I’m crossing my fingers the recipe works out for you! Wow, these look great! I’ll definitely have to give this a try. What exactly is powdered erythritol? I’ve never heard of it before. I was just looking for Food with only Stevia, not Sugar and i found Your Page.. Yeah! All the Food looks soooo delicious! Did You create this by Your own? Phenomenal!!!! I am a 30 year old woman doing Nutrisystem. I have alot of weight to lose, and am obese. Anyhow…Nutrisystem is a bit expensive. I am a huge (no pun intended lol) fan of their Chocolate Mint Patty Cookies. However, I can’t afford them, and the cookies have SUGAR in them. I don’t need any sugar. I’m sweet enough without it. I was thinking of just having the cheap processed crap…but then I wanted the protein. Then, LO and BEHOLD after searching WEEKS on end on google, I found your blog, and your recipe. I LOVE that you use Soy Protein. I can buy it for uber cheap at the bulk bin at Winco. So, that being said, I am going to give this recipe a try. Thank you so much for posting it. I want to try to figure out the calories. If I can get in 160 calories or less a cookie, I will be very happy. It’s really nice that you have alternatives to sugary junk without compromising the taste. Take care and I look foward to using more of your recipes. for mint patties recipe can I use swerve instead? PS: It’s Kristy S. again. I was wondering if you would ever consider making these and selling them. You could make good money doing it. If you do sell them, I’d like to buy a dozen from you. 🙂 I can give you my email if you would consider it. Well, when I own my own bakery one day (which I WILL!) I will definitely sell these, and you can be my spokesperson 🙂 They are super fun to make and they’re delicious. Thanks Kristy! Does the coconut oil in the Chocolate Coating help melt the chocolate? And is it necessary to add it?